Released earlier this year, Zachary Cale’s Blue Rider marked the singer-songwriters fourth full-length release – a deft meditation of fingerpicked guitar, drifting feedback and reverb laden vocals. 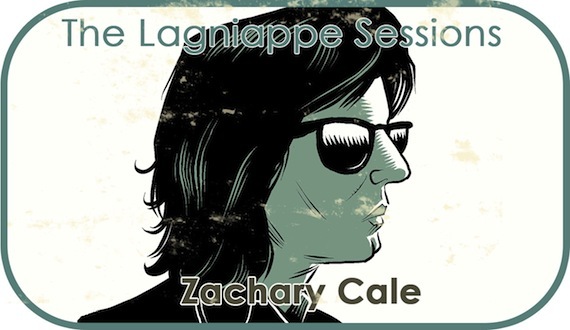 This week’s installment of the Lagniappe Sessions catches up with Cale as he interprets four selections, from Brian Eno and the Stooges to the late JJ Cale and Peter Laughner. Cale, in his own words, below. Thought I’d tip my hat to a dude that carries the same name as me. JJ is the coolest, his songs are instantly recognizable. He’s got a swampy atmospheric sound that’s completely his own, though Clapton sure has made a career out of copping it. He’s one of those guys that can stand on stage alone and just blow you away with a simple two-chord song. Criminally underrated and gone too soon. Another Green World is one of my all-time top favorite records. It’s damn near perfect, and this song is a highlight among many. It plays like a dream you don’t want to wake up from. I’ve read interviews with Eno where he talks about how songs are basically a vessel to get his ideas across. He chooses words for effect rather than meaning, but even so, his lyrics really hold up even when taking out all the sonic textures. I listened to this record a lot when making Blue Rider. I’m really drawn to how he blends synthetic and acoustic instrumentation together to create something otherworldly. Most of the songs on Blue Rider incorporate old blues tunings. One day I was at band practice and the melody and rhythm to this song popped into my head. Iggy has gone on record saying that his goal with The Stooges was to create his own mutated version of the blues. That’s a statement I can get behind. We’ve been ripping this tune in our live set on tour recently. Before I ever got into Dylan, Townes, or even Neil, I was obsessed with a little known figure by the name of Peter Laughner, and his album Take the Guitar Player for a Ride. I grew up on punk and by the time I was in college I was discovering bands like Pere Ubu — Laughner founded the band with David Thomas. Someone burned me a CDR of the Laughner record which is basically a collection of demos and unreleased songs. With his weary heart broken delivery, this song captures the essence of what he was all about. It has that druggy stream-of-consciousness vibe, sorta like “Heroin” meets “Sad Eyed Lady”. He died at the age of 24. Still can’t believe this record hasn’t been reissued yet. Cale’s blue rider has been my fall record here in Baltimore.